Have you guys ever seen these featured? 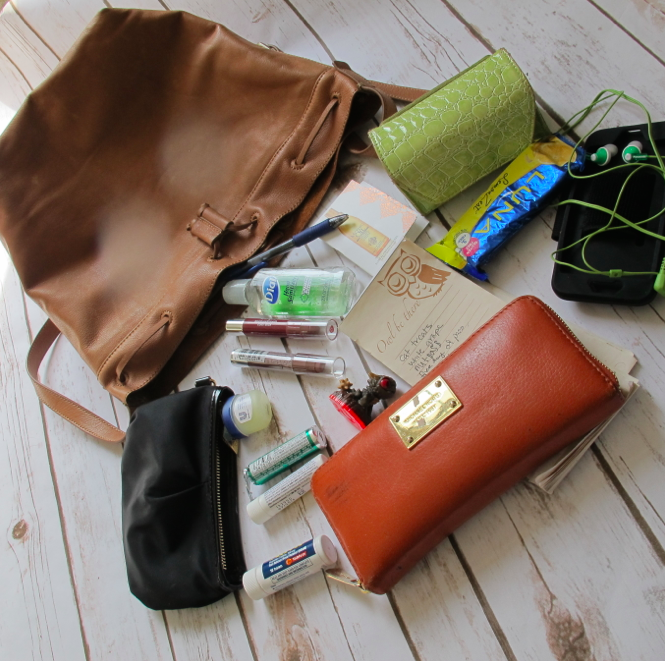 I love seeing these posts when others share what’s inside of their bag. So here’s what’s in mine. I’ve been carrying my J.Jill Bucket Bag this month and still love it. I didn’t cheat and clean up so that hopefully explains the craziness of my purse. Yes that’s a Skylander, no I have no clue why it was in there? I’ve had my Michael Kors Wallet forever (I got it at Lord & Taylor and it’s similar to this one only it doesn’t have the iPhone pocket). I always carry a little bottle of Advil and I also have a tube of Dramamine since we were just in Florida and I always bring Dramamine with us when we travel since my kids get car sick. Also pictured: grocery list (that if you look closely you can see the kids hijack and add things they want), iPhone 6 running case, headphones, Vaseline Lip Therapy, a Luna Bar (breakfast every morning), my Card Cubby and some Breathsavers. So. Wanna play? I’d love to feature YOUR bag next week so send me a pict or comment below if you want to be featured. Here goes: My calendar, checkbook, Gucci wallet I have had now for 12 years. Thought it was an extravagance at the time but one of my best investments!!! I will probably have it for another 10 years!!! Make up. comb, chapstick and handcream. And last but not least…my dumb phone. You heard me…my DUMB phone!!!! Some day that will be worth a fortune!!!! Misprint above. I’ve had my wallet for 22 years…not 12. This is such a great post! My bag is such a gross mess, it would be embarrassing to share, but maybe that means I should? Haha! If you need someone who carries bags within their bag, I’m your girl! I have a cross shoulder baggalini bag with outside pocket for MY DUMB phone (that i LOVE), an outside pocket for my keys on a keychain that also holds about 12 of those little store keycards, inside bag: chapstick in a little holder built in, slots for cc’s , license, etc, a pack of wet ones (which are always handy, coin purse for small change and a few dollars, and if i remember to fit it in, my day calendar. Actually, because of the way the purse ifs set up with slots, pockets, compartments, all are pretty organized. I would never be able to find anything otherwise.